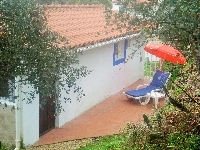 Welcome to our selection of holiday rentals in Alentejo. Alentejo is a region of Portugal between Lisbon and Algarve bordering the Spanish regions of Extremadura and Andalucia. It is the largest region in Portugal, about a third of the whole country, however much of this region is made up of undeveloped uninhabited countryside and mountainous areas, some of which are part of the several protected national parks of Alentejo. The typical climate for most of Alentejo is incredibly dry and extremely hot. The region is generally known for its peaceful, quiet and a very laid-back nature. There are still many places of natural beauty and also charmingly rural white-washed villages. The people who live here take life slowly and stress is almost unheard of. �vora is the main town in Alentejo with several historical buildings and monuments. There are a several different styles of architecture that can be seen in the town; among the more prominent sights are Roman ruins, a bone chapel where the walls are decorated with human skeletons, several cathedrals, churches and museums. One nice feature in �vora are the small typical houses built into the archways between the legs of the old aqueduct. There are several shops here that sell a variety of goods and traditional hand-made souvenirs. A farmers market takes place every Saturday morning and a food market is held every morning. There are also several restaurants around the town which offer a wide variety of cuisines and dishes. It is a pleasant town to walk around, especially if you are interested in seeing historical buildings and monuments. If you are the type of visitor that wishes to completely get away from the stress of the town life getting back to nature and going for long walks in a traditional Portuguese wilderness, Alentejo is an ideal location for you. But for those people who do enjoy discovering pleasant traditionally Portuguese villages and towns, Alentejo has them too. Looking for self catering holiday accommodation in the Alentejo? Then below is a selection of holiday villas in Alentejo and holiday apartments in Alentejo that can be rented direct from their owners. You can either click on each listing for further details or you can use our search engine on the left if you are looking for something in particular.